You can get an iPod anywhere! What about something a little more unique! Come to the Smokies to do your holiday shopping, and you can get, not only all those popular gifts everybody wants, but also some things that will show that special someone that you put a little more thought and care into their gift! Come to one of our special candy kitchens, such as the Ole Smoky Candy Kitchen, located at the entrance to the Village Shops near traffic light #6, and you can find a variety of fudge, taffy, and other candies still made the old-fashioned way! You can’t beat the fudge they make here! And it’s so fun to watch them making the taffy, you will have to take a video or some pictures of it being made to include with the taffy you give them! If you can’t take your loved-one(s) to the Smokies with you, bring a piece of that beauty back to them with a painting or photo by a local artist! No one can capture the beauty and grandeur of these mountains like those artists who live here and love the Smokies with all their hearts! There are a variety of talented artists and photographers to choose from! From hand carved knickknacks to handmade furniture, candles, baskets, and even Christmas ornaments, if you can think of something you’d like to get hand-crafted, you can find it here! We have a very large, very talented community of crafts-people here that take great delight in making those special, hand-made items! One popular and unique item is a Chainsaw Carved Bear. Granted, if you’re flying home, this gift may be a little too heavy to check as baggage, but since Gatlinburg is a day’s drive from 1/2 of the US…I couldn’t resist. At Make it Magic in the Arts & Crafts Community in Gatlinburg, you can get your very own “Stump Brother.” These bears are carved with a chainsaw and detailed with an angle grinder. Each bear is signed and numbered and comes with a Birth Announcement, too! This area is well-known for our quilts! We even host the Annual A Mountain Quiltfest each year! Come for the Festival in March! Or, if you want to get one for someone as a Christmas gift this year, just come to our Gatlinburg Arts & Crafts District! There is a super cute little quilt shop out there called Mountain Stitches! Check out their blog to see pictures of some of their quilts and fabrics! Yes, there are Hard Rock Cafes all around the world, but you don’t need to go to the one in Fiji to get some Hard Rock souvenirs! Just come to Gatlinburg! Come enjoy our own unique Hard Rock! Although it may be easier than you think to get a black bear into your car, I find it difficult to believe that you would proceed to get into your car with the bear and take it home with you! You can, however, find tons of Black Bear Collectibles here! 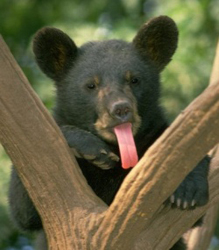 If you come stay in a cabin, you stand a good chance of being able to take some of your own pictures of a bear or two! If you’d rather go the safer route, you can find black bear collectibles in just about every craft shop, gift shop, and convenience store in the area! The dulcimer is a fretted, plucked musical instrument. Some people think it looks like a violin crossed with a guitar. And, while its origins are suspected to be Persian, the instrument has enjoyed a strong revival in American Folk Music. Smoky Mountain Dulcimers Owner Mark Edelman is certain he can teach you a tune in just 2 minutes, and he sells songbooks and instructional materials to go along with the dulcimers. If you aren’t musically inclined, there’s no doubt that one of your friends or family members will enjoy owning the music on CDs starting at just $10. Moonshining has a long history in Tennessee, and in this country as a whole. Now, some local attorneys have opened Tennessee’s first legal moonshine distillery! They sell a few unaged moonshine products, including corn whiskey moonshine, apple pie moonshine, sweet tea moonshine and peach moonshine. Come to the Ole Smoky Distillery to get your own jar of moonshine, or some to share with a friend! We know you enjoy it here! Why not get your friends and family addicted too?! Get them a gift certificate for a stay in a Cabin or Chalet! Or maybe a gift certificate for a local restaurant, tickets to a show or Dollywood, or even season passes if you’re feeling generous! 10. All Things National Park. We love the Great Smoky Mountains National Park, and the Great Smoky Mountains Association has been a non-profit partner of the Park since 1953. They are the official source for maps, guide books, and branded clothing. And lucky for you, they have an online store. So even if you forgot to get your uniquely Gatlinburg gifts while you were here just last week, you can simply order online!